Map of the Alaska Highway, from the Federal Highway Admnistration at fhwa.dot.gov. Why Canada and United States? When their continent-spanning railways were built, Canada and the United States took decisions to keep them separate and nationally contained. That cost Canada a lot of time and money, because the preferred route would have taken the Canadian Pacific Railway down through Chicago to avoid a mountainous stretch. But something entirely different happened when Canadians and Americans cooperatively planned and built a connecting roadway. Informally called the Alcan Highway, it became today’s Alaska Highway, northernmost section of the Pan-American Highway. 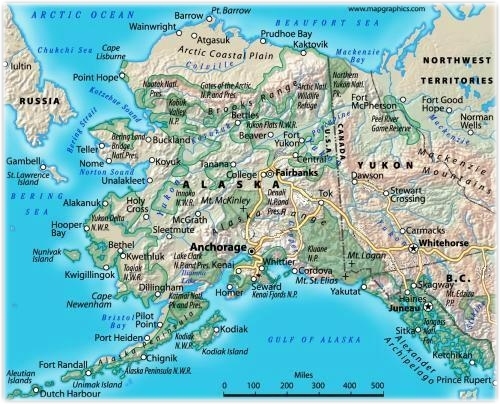 With climate change transforming the Arctic region, the development of Alaska is a current political and environmental issue. Czar Peter the Great of Russia, in 1725, hired a certain seafaring Dane to explore the waters and land of the Northwest Coast. He sailed through a strait that later bore his name. He was Vitus Bering. Bering reported the first treasure: fur. As a result, the species of sea otter was nearly extinguished due to Russia’s desire for the soft and waterproof fur. Novelist James A. Michener brings the environmental issue to life in his sensitive imagining of a mother sea otter bobbing in arctic waters with her tiny newborn cub snuggled on her furry belly; both, mother and child are ruthlessly murdered for their pelts. Many years after Peter the Great’s directed expedition, sea otters were afforded protected species designation in 1911. Sometime before that, however, Russia went through bad economic times and had to sell Alaska. The purchaser was the United States, in October 1867. Cook Inlet, from Alaska Volcano Observatory at University of Alaska at, avo.alaska.edu. The next treasure: gold. Shortly after the United States bought Alaska, gold began to be discovered in the new territory. There were early findings as far back as 1832, but only in very small deposits. But right after the Alaska purchase, larger and larger amounts were discovered. Cook Inlet and Mastadon Creek in 1894 were significant finds. In 1896 a big discovery led to the famous name of Bonanza Creek. Soon the word, Klondike, became synonymous with riches; it was originally known as a river. But it was now a river of gold, delivering over $1 million worth of the valuable ore into Seattle’s port. The next year? $200 million. In that same year, the U.S. Congress authorized construction of a railroad; seven years later, both rail and telegraph brought commerce into a newly modernized transitway connecting Valdez to Fairbanks. The gold rush was on. Gold eventually began to run out, but it was just as a third treasure appeared – liquid gold. In 1835, Cook Inlet’s waters revealed a small slick of what seemed to be oil. Almost 60 years later, oils claims were filed. But the ore obscured all, until around 1944 when oil exploration became to become a serious business. When gas and oil were discovered on the North Slope in 1968, the world markets for energy had heated up. Interest was high and so was value. The sale of the North Slope lease? $900 million. Soon the Alaska pipeline would become an icon of the third treasure: oil. There is always a reason, and more often than not a military reason, that the enormous effort of a macro engineering project is attempted. The Romans may not have been so anxious to build the aqueducts unless the Tiber River had been under threat of poison by enemy attack. Of course, eventually Rome would have grown beyond the Tiber’s capabilities anyway, so the aqueducts were a likely next step. But the when and the why are reasons for acting. It’s also true of the Manhattan Project, begun for military reasons. Even the United States Federal Highway System was originally named the National System of Interstate and Defense Highways because of its “primary importance to the national defense,” according to Section 108 (Building the World, p. 396). All the way back to the Grand Canal of China, built as an internal route that was safer from the piracy of the seas that threatened coastal waters, many achievements began for reasons of security. So it was in the case of the Alaska Highway. The attack on Pearl Harbor, Hawaii, in December 1941 drew the United States into World War II, with sudden focus on the Pacific. Sharpened by Japan’s occupation of three Aleutian islands in 1942, America’s defense response was to build a road through sub-Arctic territory in the largely uncharted wilderness between Fairbanks, Alaska and the railroad terminus at Dawson Creek, British Columbia. The window of opportunity was limited: troops and supplies had to be delivered while the ground was still frozen. By February a route was chosen and the directive to begin was issued. Diplomatic notes were exchanged in mid-March but the first trainload of soldiers had already arrived at Dawson Creek. A rough “pioneer road” of heroic length (1,645 miles or 2,647 kilometers) was roughed out in six months. That road became the basis for an improved, all-weather military road the next year as U.S. and Canadian private contractors completed the effort. That portion of the Alaska Highway that lies in Canada (1,200 miles or 1,900 kilometers) was transferred to Canadian control in 1946; the entire road was opened to civilian traffic in 1948. What began as a military threat response brought on cordial and cooperative teamwork. All the normal administrative logjams were removed, rights for land use were readily acquired and agreed. Canada smoothed out potential barriers, making it possible to use their land and lumber; they even remitted taxes. The U.S. War Department planned the Alaska Highway, cooperatively with Canada, to link airfields from Edmonton, Alberta to Fairbanks, Alaska. The entire project was planned from the air, partly because the route was to link up the airports and partly because time was too short for the usual topographical surveys. Like the Trans-Siberian Railway before and the Mont Blanc Tunnel after, the Alaska Highway’s route turned out to be the same one carved by old native trails and winter sledways whose tracks are still etched like runes into the ancient landscape. The 2012 Global Conference on Oceans, Climate and Security, held at the University of Massachusetts Boston on May 21-23, directed by Robbin Peach, Executive Director of The Collaborative Institute for Oceans, Climate and Security (www.umb.edu/ciocs), gathered experts together to discuss issues relevant to the Arctic. Of special note is warming of the Arctic Ocean waters perhaps opening the Northwest Passage. The Northwest Passage is a legendary sea route traversing the Arctic Ocean, sailing along the northern coastal area of North America using waterways in the Canadian Arctic Archipelago, to connect the Atlantic and the Pacific Oceans. It’s been a dream for many years. Roald Amundsen was an early navigator in 1903-6. The trend of thinning summer ice was clear as early as 2000 when two Canadian ships crossed the passage. By 2009, Arctic pack ice shrinking led to awareness of environmental change for polar bears and other species, as well as talk of a possible waterway. In 2010, Kodiak-Kenai Cable proposed laying a fibre-optic cable connecting London and Tokyo via the Northwest Passage. Canadian authorities may view the passage as part of Canadian Internal Waters while the United States and some European countries might prefer the interpretation of international strait. From west to east, the Northwest Passage runs through the Bering Strait (which separates Alaska and Russia). It is a 53-mile long strait. There have been suggestions to link Alaska and Russia through a Bering Strait Bridge. There is a proposal for a 55-mile dam across the Bering Strait. Another possibility is the TKM-World Link Tunnel. The Government of the United States believes that the name suggested by Mr. Dimond is suitable and in harmony with popular usage. It is of the further opinion that the highway should be jointly named by the Governments of the United States and Canada in view of the location of the greater part of the highway within Canada and in view of the friendly cooperation which has made possible its construction. Nafta: Canada and the United States built a joint highway in six months, cooperatively easing permissions, restrictions, and taxes. Is the Alaska Highway an example of how NAFTA might function? Arctic Environment and Security: Climate change in the Arctic region will be an increasingly urgent issue. If the Bering Strait and the Northwest Passage open in a warming environment, what are the environmental, territorial, and security implications? Will Ernst Frankel, winner of the Onassis Shipping Award and MIT Ocean Engineering expert, prove prescient in his predictions revealed in Paris at the Davidson Lecture? Can the findings of UMass Boston’s Collaborative Institute for Oceans, Climate, and Security (www.umb.edu/ciocs/) lead the way? Christy, Jim. Rough Road to the North: Travels along the Alaska Highway. Toronto: Doubleday Canada, 1980. Coates, Kenneth, and William R. Morrison. The Alaska Highway in World War II: The U.S. Army Occupation in Canada’s Northwest. Toronto: University of Toronto Press, 1992. Davidson, Frank P., Kathleen Lusk Brooke, with Cherie E. Potts. Building the Future. Boston: 2012, “Sportsways,” Chapter Four, pages 98 to 143. Huber, Thomas Patrick, and Carole J. Huber. The Alaska Highway: A Geographical Discovery. Boulder: University Press of Colorado, 2000. Michener, James A. Alaska. New York: Fawcett Crest, 1988. Twichell, Health. Northwest Epic: The Building of the Alaska Highway. New York: St. Martin’s Press, 1992. For a brief time line, http://www.themilepost.com/timeline.html. For a history of the Alaska Highway, with pictures, and some poetry by workers, http://themilepost.com/history.html. (copyright Morris Communications, 1998). For information about the highway as part of the U.S. program, see http://www.fhwa.dot.gov/infrastructure/blazer01.htm. For more on NAFTA, www.law.duke.edu/lib/researchguides/nafta. For more on The Collaborative Institute for Oceans, Climate and Security at University of Massachusetts Boston, www.umb.edu/ciocs/.